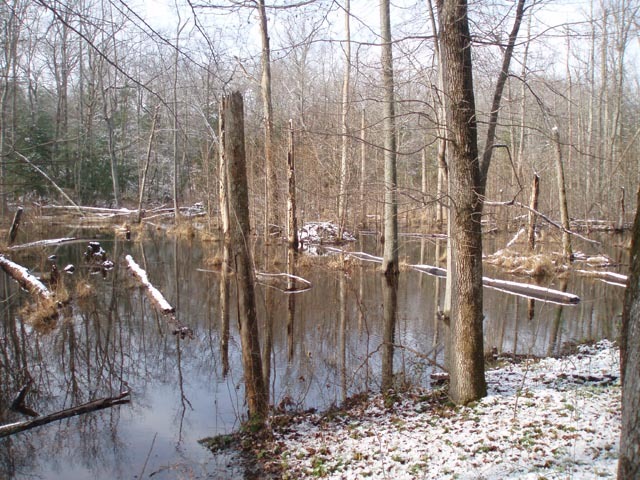 Discription: Cedarville State Forest is composed of 3,510 acres of land at the headwaters of the Zekiah Swamp. It is literally minutes from the Capital Beltway and being such makes for a quick fix getaway from the hectic urban life style. 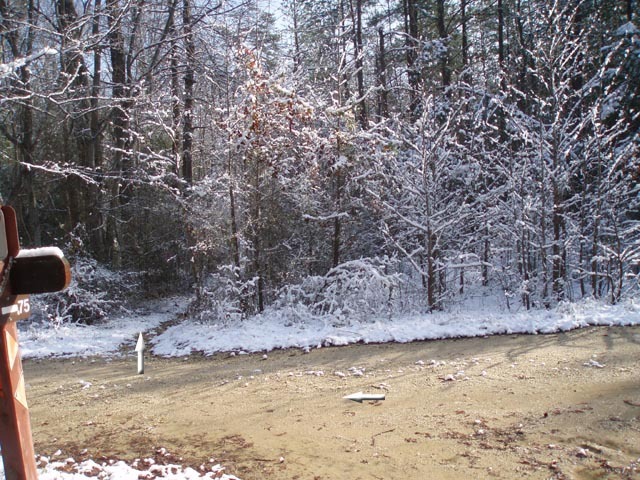 Forest type varies from mixed hardwoods to large groves of Loblolly and White Pine both with a understory of American Holly, Low Bush Blueberry and an occasional Mountain Laurel. 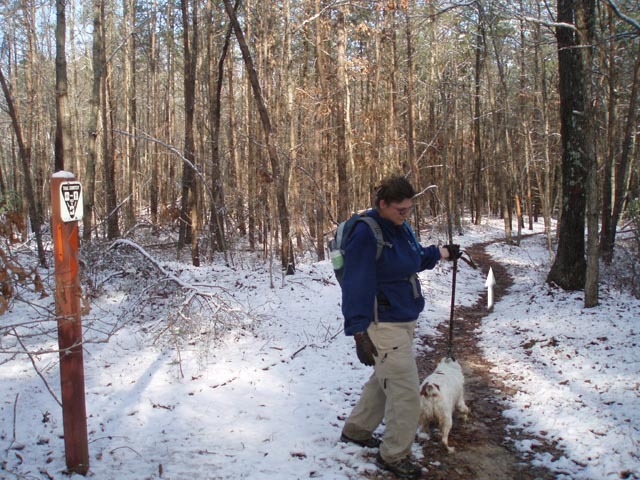 The 19 mile trail system is comprised of 5 loops that can be combined to form longer treks. It is well maintained and signed. 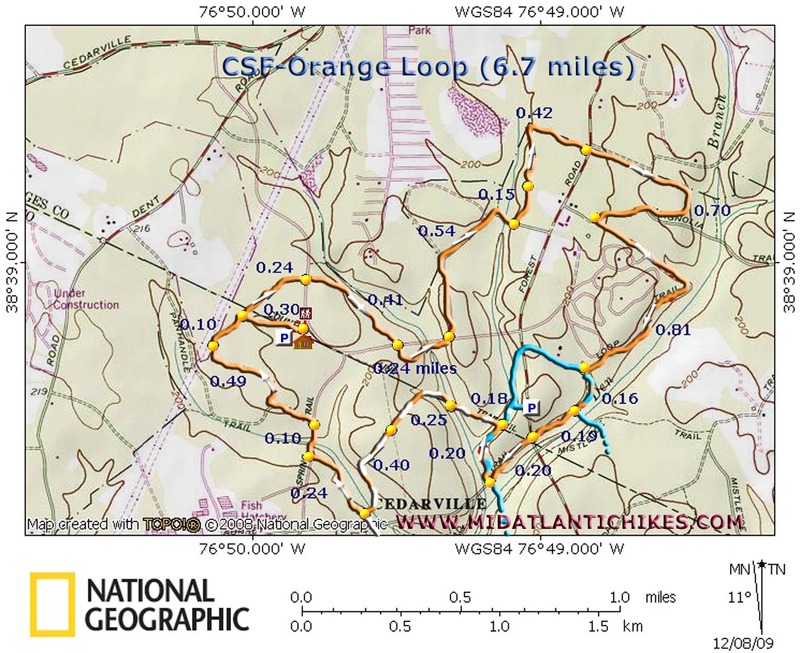 Each loop is marked with color coded hiking stakes (some with mileage) and arrows making it very difficult to get lost, especially if you have a map. Being in a lowland forest/swamp there is very little elevation gain. For the same reason parts of the trail can be pretty wet. Wear waterproof hiking boots. 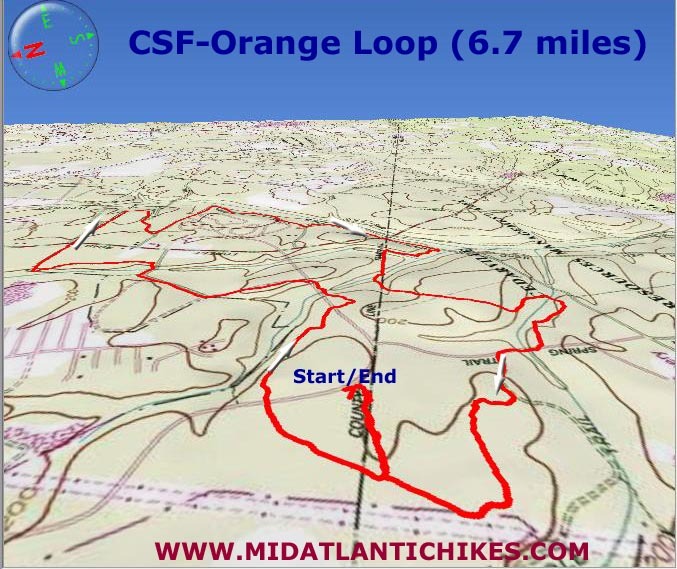 Described here is the pretty easy Orange Loop Trail. 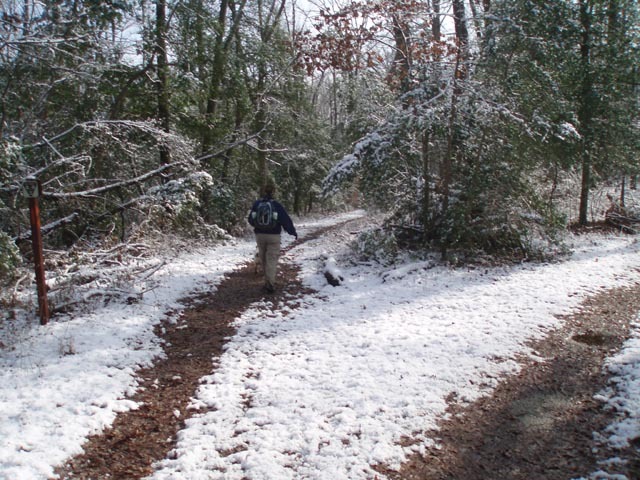 It is a great hike to take the kids and/or Fido on. The traihead is at the Visitor Center Parking lot. There is a $3.00 park use fee. 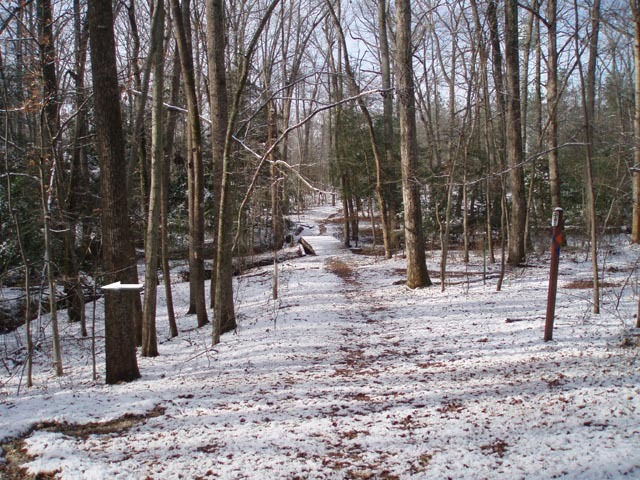 Trail Notes: From the kiosk walk towards the Visitor Center. Turn right onto a footpath marked with an orange stake. In 0.30 miles turn right onto the main loop. In 0.24 miles cross Bee Oak Road for the first time. Cross it again in another 0.41 miles and than a final time 0.24 miles from the previous crossing. 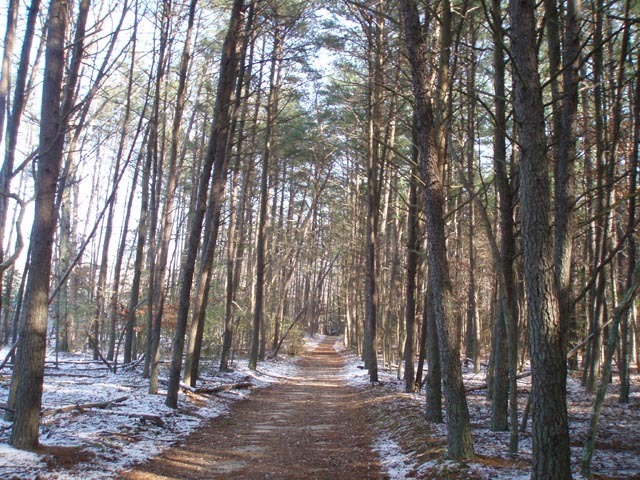 Here you join an old road that skirts the first of several pine groves you'll hike through. 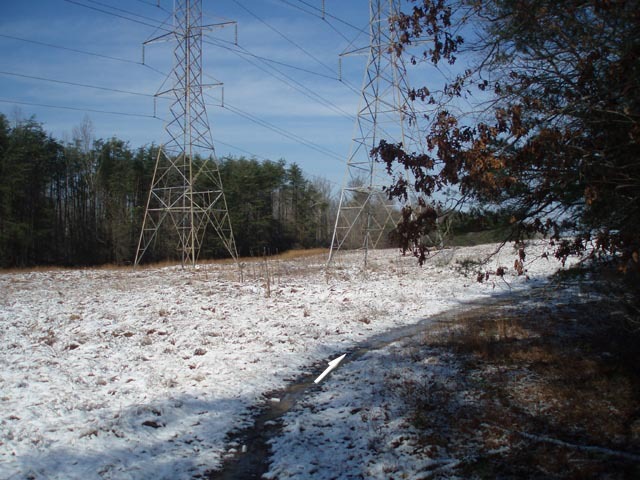 As the trail bends to the right a power line will come in sharply from the left. 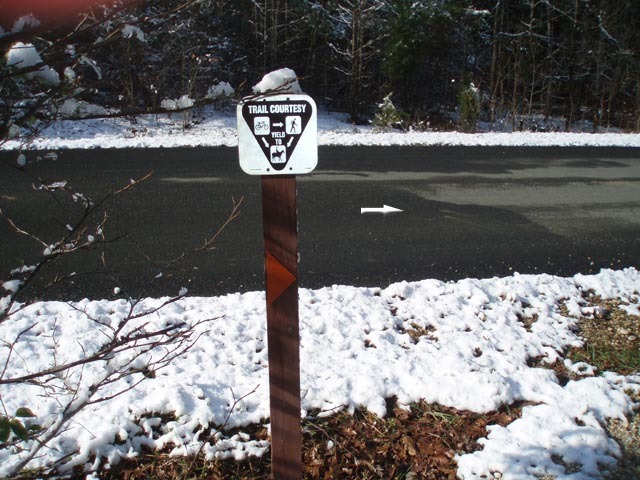 At 0.54 miles from the last Bee Oak Road crossing the trail turns left off of the power line road and in another 0.15 miles passes an orange blazed spur trail on the right that leads out to Forest Road and maintenance buildings. 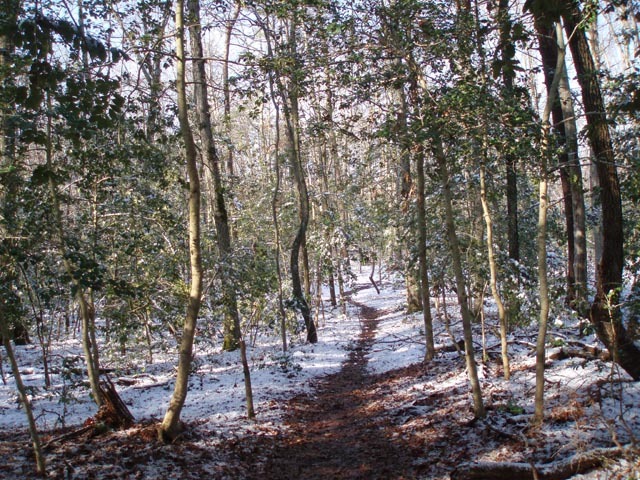 (This trail is not shown on the forest map.) Stay straight here staying on the main loop. 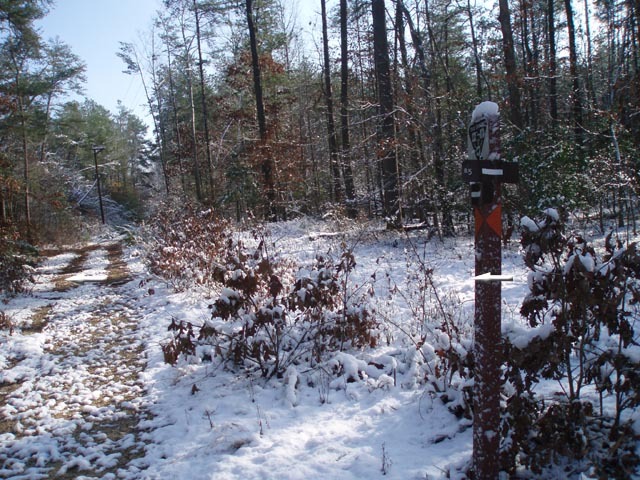 The trail will make a sharp right turn and in 0.42 miles from the spur trail you passed arrive at dirt Forest Road. Cross the road, jogging slightly to the left to regain the trail. From here the trail will make a deep "U" turn before arriving at a gravel road that skirts the family campground in another 0.70 miles. Turn left, passing the camping loops on the right and then the amphitheater on the left. 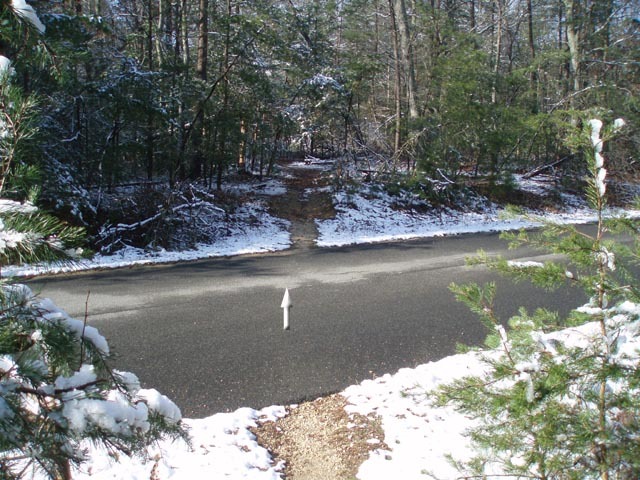 shortly after this the trail will veer slightly to the left, leaving the road and in a bit make a sharp right turn. 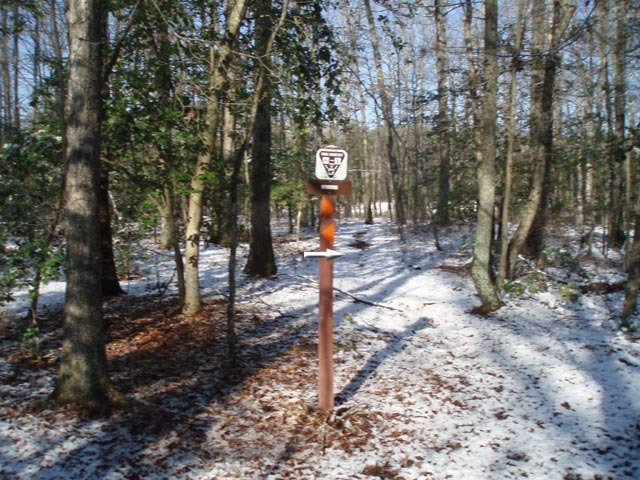 In 0.81 miles from the turn onto the campground road the Blue Trail will join from straight ahead. 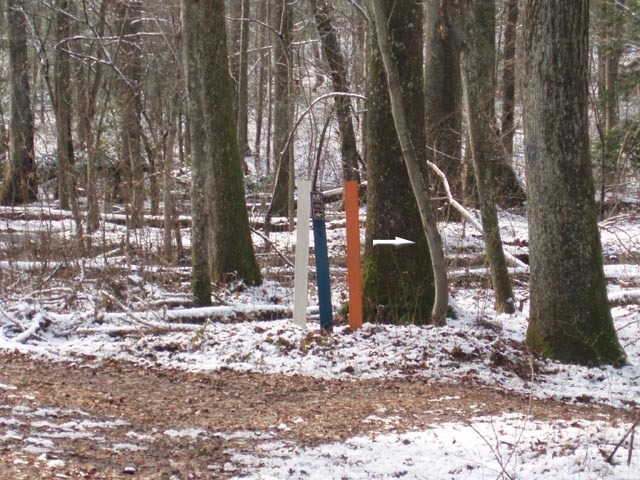 The joint orange/blue trail turns left here. Follow it. In another 0.16 miles the Blue Trail will leave to the left. 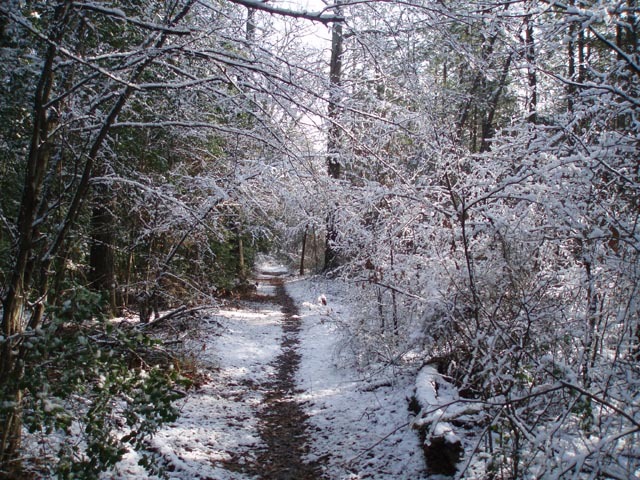 Stay straight on the Orange trail. In another 0.19 miles cross dirt Forest Road again, jogging slightly to the left to pick up the continuation of the trail on gated Sunset Road. 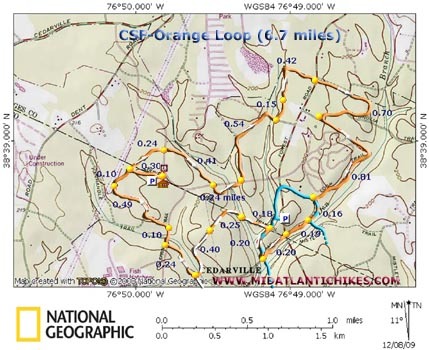 In another 0.20 miles, just before a bridge, The Orange, White and Blue Trails come together. Turn right and follow all three for 0.20 more miles, keeping an eye out for a rather substantial beaver pond with a large hut on the left as you go. 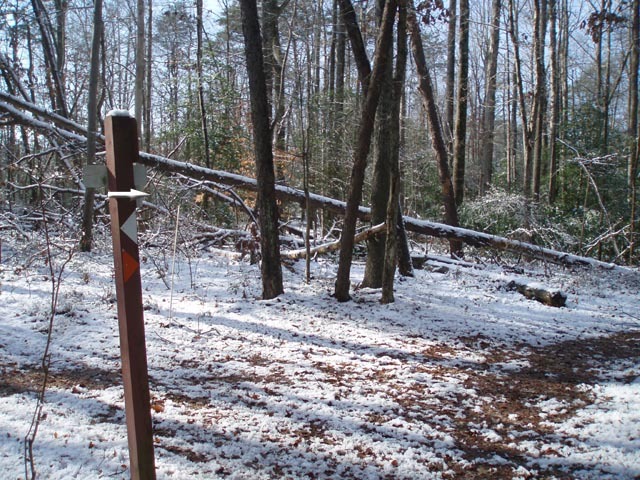 The blue and white spur trail will continue straight here. You want to turn left onto the dual blaze Orange/White Trail. In 0.25 miles cross an abandoned, grassy road and in o.40 miles turn right as the White trail turns left. 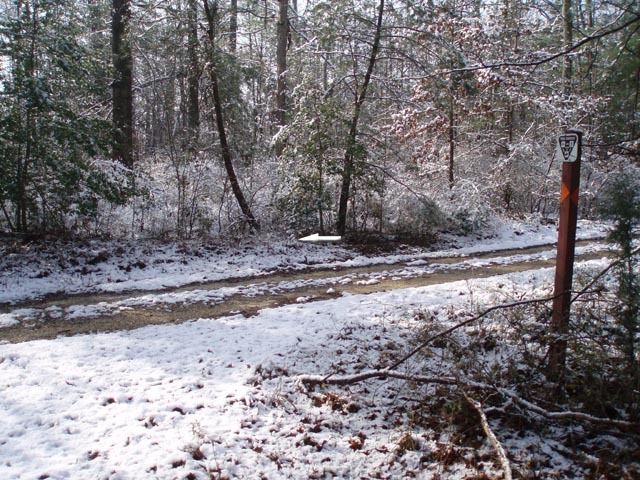 In 0.24 miles from this turn arrive at paved Hidden Springs Road. 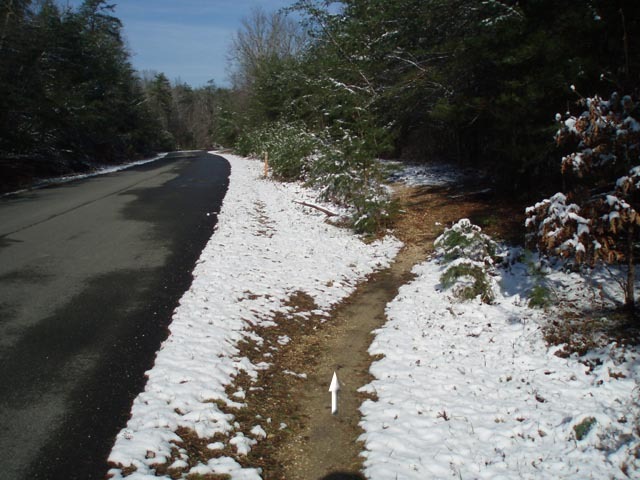 Turn right, following the shoulder for a few steps before joining a short section of trail that parallels the road. In 0.10 miles cross the road. 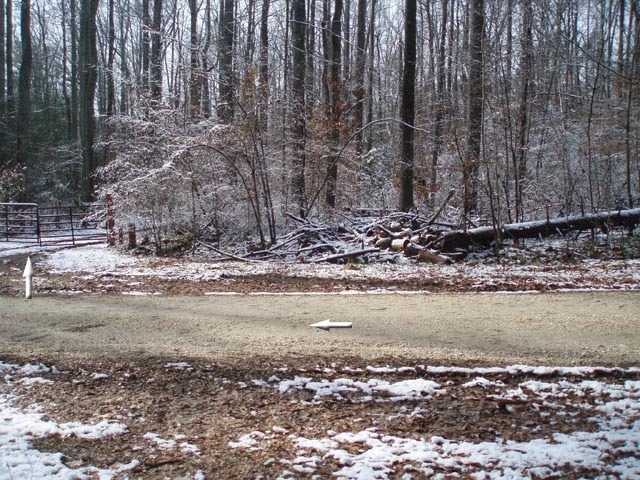 In another 0.49 miles turn right, following the edge of a power line swath for just a few steps before re-entering the woods to the right. In another 0.10 miles arrive back at the Visitor Center spurn. Turn right and retrace your initial 0.30 miles back to your vehicle. Critique: My husband and I really enjoyed this hike. Weather was perfect for February. Low 40's and an overcast sky with no wind. 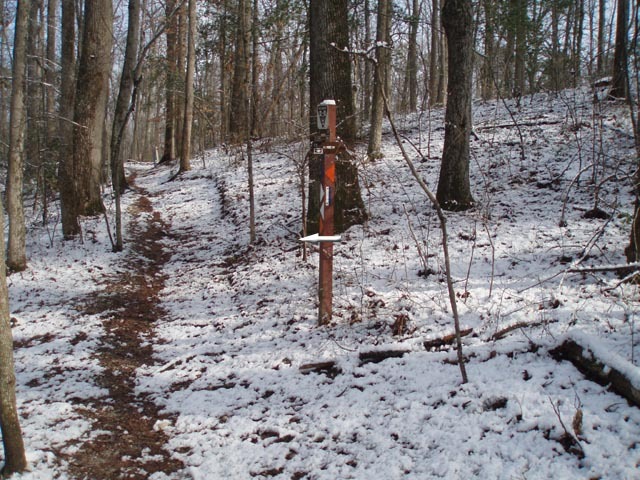 The trail was marked great with orange arrows and the paths were very easy to follow. The paths are very level with few hills to climb. We only encountered 5 people on this 6.7 mile hike. Two were mountain bikers and the rest were hikers. It was very quiet and peaceful. I imagine it is a pretty quiet forest in the winter. The highlight was the beaver pond. You could see freshly fallen trees where the beavers had chewed right through them. There is a $3.00 parking fee. The visitor center is closed on Saturday's and Sunday's. There is a sign outside of the visitor center recommending that you wear bright orange. 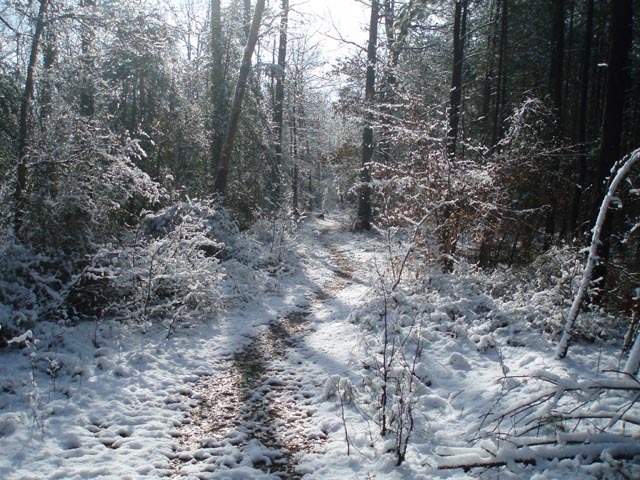 Part of the forest is a designated hunting area, but the paths do not travel through this area. We did hear gunshots but they were so far off in the distance they were insignificant. I would recommend this hike to others and hope to do it again myself.